Speed, strength, safety and simplicty The frames of Clearspan Gala Tent Modular Marquees are manufactured from high-grade aluminium extrusions to provide strength whilst minimising weight; there is no need for centre supports or guide ropes. 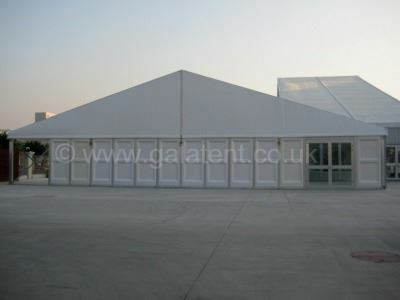 Gala Tent Modular Marquees can be located on most surfaces including tarmac, concrete and grass. 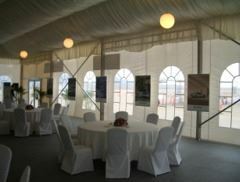 The lightweight frame makes Gala Tent Modular quick, simple and safe to erect with no special skills or tools required. 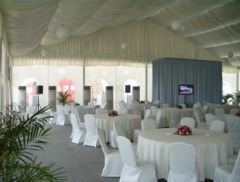 Gala Tent Modular Marquees can be manufactured to meet virtually any size requirement. Versatility and adaptability- Extending your Modular marquee with add-on bays Gala Tent Modular Marquees are extremely versatile. Typical bay sizes range from 3m to 5m and you can purchase add-on bays to make your structure larger. 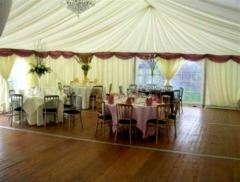 The adaptability of Gala Tent Modular Marquees means you can downsize your marquee if required. For example, your 6m x 12m Gala Tent Modular Marquee can quickly be transformed into a 6m x 3m, 6m x 6m or 6m x 9 marquee – and without needing any additional components! Transformability You can transform your Gala Tent Modular Marquee into a truly spectacular venue by incorporating new stunning stain roof and wall linings. Durability and quality – Gala Tent Modular Marquees are built to last, and here to stay. Gala Tent Modular’s heavy-duty PVC material simply slots into channels in the high-grade aluminium extruded framework - no bungee straps or ties are required. The joints and pedestal feet are made from heavy-duty galvanised steel and are bolted to the frame. Gala Tent Modular has been proven to withstand wind speeds of up to 80 mph when using the recommended tensions bars and ground anchor pegs. Gala Tent Modular is like a chateau with PVC walls! 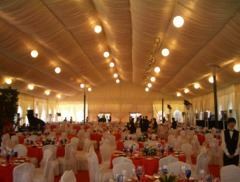 Canopy Roof Material The Gala Tent Modular canopy is designed in a classical wave drape pattern. The material is UV-stabilised, anti-fungus treated, and fire-retardant to stringent EU standards. 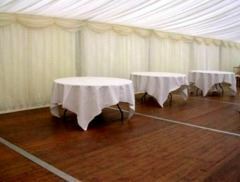 Many modular marquees use 450g to 600g PVC. 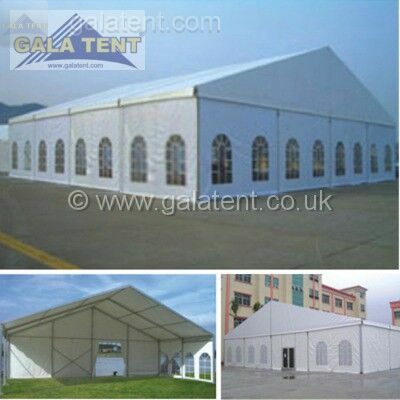 Gala Tent Modular uses 750g PVC making it, we believe, the highest specification model available. 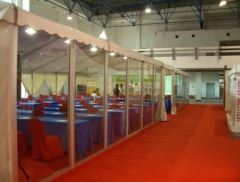 Side Panel Material Gala Tent Modular side panel covers are also UV-stabilised, anti-fungus treated and fire-retardant to stringent EU standards. 650g PVC material is used and the panels can be supplied with or without windows. 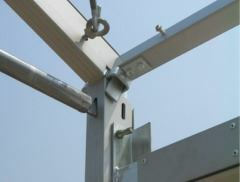 The side panels include a central zip entry so access can be created at any position around the structure and they can be tied back to the leg poles if desired. 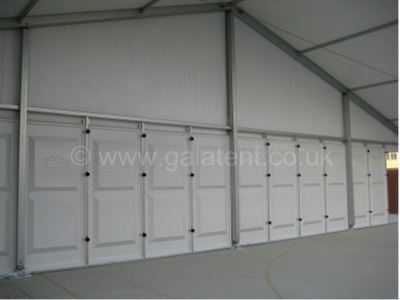 The Gala Tent Modular side panel material is fire-rated to BS 5867:1980 Part 2. Roof & Wall Satin Linings Gala Tent is delighted to introduce its new high-quality, fire-retardant, satin lining. The lining helps to create the effect and atmosphere perfect for weddings, parties, company meetings or corporate events. The 3m long lining drapes can be gathered in to 1m for maximum effect. Linings are available in a variety of colours and fabric types and meet all current EU flame retardant requirements - BS 5867:1980 Part 2. Galvanised Steel Ground Bars Whilst some manufacturers of modular structures sell ground bars as an optional extra, all Gala Tent Modular structures are supplied with ground bars as standard. The bars simply slot through the side panels and bolt to the legs to provide maximum stability. 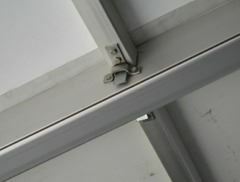 The bars also provide a clean, taut finish to the side panels of your marquee. 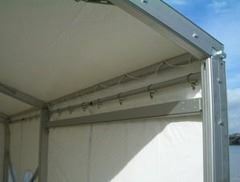 With Gala Tent Modular there are no crinkly, sagging panels blowing in the wind! 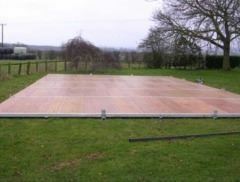 Wooden Modular Flooring on a Steel Sub-frame Gala Tent’s modular wooden flooring provides a level, solid and stable platform – ideal for dancing the night away! The bottom layer consists of steel cross-bearers: each cross-bearer has an integral base plate. The base plates are fixed firmly to the ground using earth anchors. The second layer comprises steel joists which sit on top of the cross-bearers. Lugs on the cross-bearers ensure the joists are held securely and accurately in place. The pressure-treated wooden boards are laid on the subframe and locked in place by wooden battens. For adjoining flooring modules, an extruded aluminium edging is used to ensure perfect continuity. 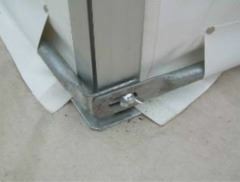 Once you’ve laid your flooring, you can connect the legs of your tent structure directly into the subframe base plates. 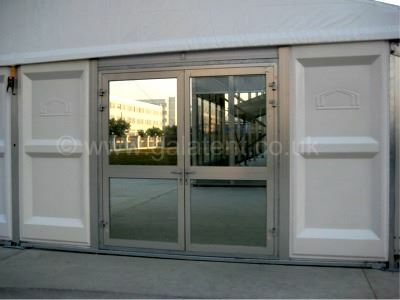 Glazed Door Units Your Gala Tent Modular can include high quality single or double door units. All door systems are supplied with a standard height of 2.10m. 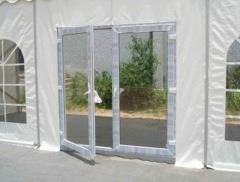 Glazed Windows Glazed window walls are available in a range of sizes to suit all Gala Tent Modular structures. Manufactured from durable PVC material, and incorporating the latest in all-weather adhesives and high-frequency welding, the contemporary design of Gala Tent Modular’s window walls enhances the visual appeal of your marquee. 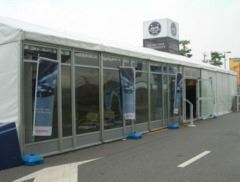 When you purchase your Gala Tent Modular structure you have the option of upgrading from standard white sidewall sections to window walls: clearly an attractive option. Solid Wall System According to the British Plastics Federation, ABS (Acrylonite Butadiene Styrene) is, ‘..an ideal material wherever superlative surface quality, colour fastness and lustre are required.’ ABS has, ‘…a good balance of properties (including) toughness, strength and temperature resistance.’ It is likely that many of your car’s exterior trim panels are manufactured from ABS. The Gala Tent ABS ‘solid wall’ system can be fitted on any of our modular structures in place of standard sidewall sections: it can also work in tandem with our modular wooden flooring. Single or double door units can be incorporated into your ABS ‘solid wall’ system. The ABS ‘solid wall’ system is quick and easy to install, and enhances your Gala Tent structure by providing a feeling of robustness and permanency. Gutter kits and infill panels are used when joining 2 or more structures in parallel. Heavy-duty anchor pegs are also a strongly recommended optional extra. Tables, chairs, heating and lighting are also available.